Agrimatics Libra TMR Sends Weights Straight to Your Phone or Tablet. The indicator is no longer needed in this scenario. 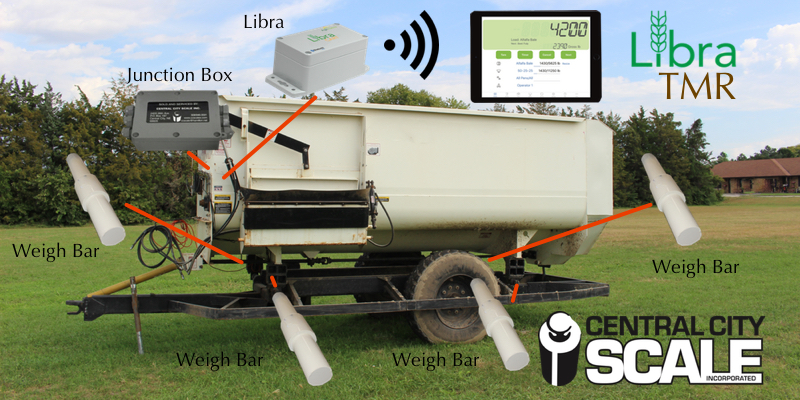 Using the same technology as the Libra Cart platform, the feed and ration management system is iPad-based and connected to load cells on the mixer using Bluetooth electronics. Libra TMR allows all the ingredients to be entered into the app, the rations with all the ingredients as part of them, and it allows the operator to assign what ration gets fed to which pen, how many head are in each pen. It makes it easy to execute a ration — to feed it properly. Using Agrimatics’ cloud service (Coming Soon), a nutritionist can also log in and remotely manage rations for their customers. View and tare live weights from multiple mobile devices within approximately 400 feet of the mixer.